All R.C.C Structures •Increase Life of Structures •Doubles the strength of Structures •Strong resistance to U.V. rays, fire, several acids and alkalis. LeakSeal[India] are pleased to introduce ourselves as a leader in Waterproofing, Paintings & Structural repairs solutions. With an experience of over two decades, we constantly endeavor towards customer satisfaction by delivering products and services of the best value and quality with professional and systematic approach. It is on the forefront of product customization to tailor each product to customer needs and to overcome high upfront consumer costs thereby maintaining and enhancing asset value of the clients’ property. We have successfully carried out various jobs in government and private sectors offering 100% quality waterproofing solutions and services in different segments like, restoration, renovation, structural repairs and Retrofitting, structural audits, interiors, construction, development, fabrication with designs and landscaping. Providing quality services and meeting customer expectations time and again has helped us enjoy repeated patronage. Our Clientele includes Nuclear Power Corporation of India (Maharashtra, Gujarat & Karnataka), LAVASA (Pune), Pittie Group, UTI Infrastructure, NOCIL Infrastructure, Siyaram Silk Mills Ltd, Reserve Bank of India, State Bank, of India, Dena Bank, Citi Bank, General Insurance, LIC, New India Insurance, Wadia Hospital, Harmony Lifestyle Group, Infinity Mall, Mumbai International Airport, HPCL, Ordinance Factory Pune, numerous Housing & Industrial Societies, Consultants, Schools etc. A sharp visionary approach by our Director, backed by a team of dedicated experts has seen the company make its mark. Today, the company employs global technology and superior talent to offer an entire range of excellent Civil Construction and Construction-chemical products. 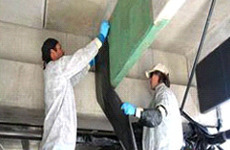 The company has been providing services in Nano-technology waterproofing treatment. We also are a leading supplier of services for waterproofing membranes in polymer bitumen. Our manufacturing of a gamut of APP SBS Self-adhesive membranes and Protection boards is also one of the highest in the country. Though we have tamed technology to offer our clients a range of innovative products, we still have an eye for detail and supervise every product that leaves our factory with utmost precision. Further, we customize the products to suit every changing need. Since its inception in 1990, LeakSeal has never looked back. A sharp visionary approach by the Director, Mr. R. E. Chauhan, backed by a team of dedicated experts saw the company make its mark in the field of waterproofing and structural repairs. LeakSeal has met customer expectations time and again and enjoyed repeated patronage with its quality services. However the scenario was never the same before Leak Seal’s entry in the market. This segment was always looked upon as a disorganised sector with very little scope for development. However, the credit to change people’s perception and earn repute totally goes to LeakSeal. Within a short span of time LeakSeal has changed the face of the Waterproofing & Structural Repairs industry in India. Thanks to its cutting edge technology and team of professionals. The result, an unmatched performance like no other. Our superior quality and timely delivery has won us the patronage of several clients across sectors.